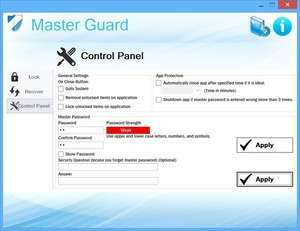 Master Guard is a data security solution for Windows. Master Guard is the most comprehensive solution for data security available on the Internet. It lets you lock, hide and protect files, folders and drives with only a few clicks. Master Guard makes use of a master password to access all its three (3) features; Lock Tab, Recovery Tab, Cpanel Tab. For security reasons, you should also check out the Master Guard download at LO4D.com which includes virus and malware tests. Additional screenshots of this application download may be available, too. We provide a listing of several different tools for locking down several aspects of your PC. Ranges from Windows screen lock, hardware locks and more. Check out some of the freeware downloads available in the locking program category. They contain no strings and are available at zero cost.